Your next bite of local bread or gulp of Madison beer might just have a little piece of Sheboygan in it. That yeast will have traveled on collection swabs, been scrutinized in research laboratories at the University of Wisconsin–Madison, pored over in food science classrooms and finally harnessed in the brewhouses and bakeries of local companies before ending up on your table. 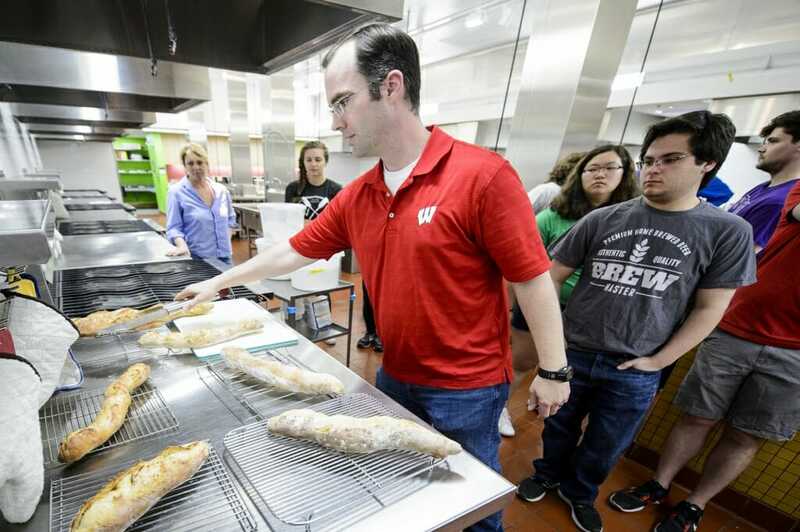 Along the way, the yeast is forging partnerships between the UW–Madison Departments of Genetics and Food Science, the Wisconsin Brewing Company in Verona and Clasen’s European Bakery in Middleton. Students, scientists and businesses are uncovering new strains of yeast, experimenting with unique beer styles and probing the microbes in bread dough to expand our knowledge of these industrious fungi and push the frontier of local fermentation. 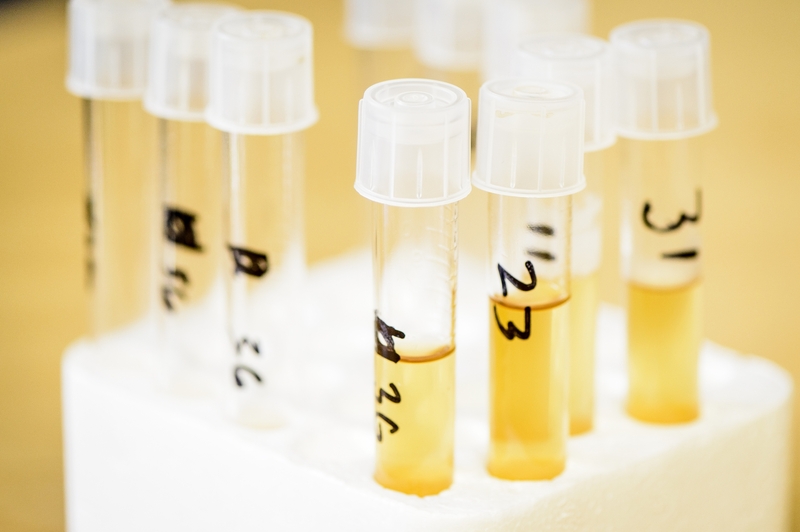 “Yeasts are understudied members of their communities, and we’re trying to understand what they do in nature, how they interact with each other, how they interact with other members of their community,” says UW–Madison professor of genetics Chris Hittinger. Hittinger is set on isolating as many kinds of yeast as he can. Often, he doesn’t have to go far. In 2011, he helped discover and identify one of the parents of lager yeast, Saccharomyces eubayanus, which merged with the bread-and-ale yeast Saccharomyces cerevisiae centuries ago. The resulting hybrid was cold-tolerant and kickstarted the world’s most popular beer style. A few years later, Hittinger’s lab found S. eubayanus for the first time in North America at Indian Mound Park, near Sheboygan, Wisconsin. The S. eubayanus prospecting and research are supported in part by the Great Lakes Bioenergy Research Center. “We’ve isolated several thousand wild yeasts from all over the country, and a large fraction of those are from Wisconsin,” says Hittinger. In honor of the Badger State, Hittinger’s group has named new species after Green Bay meat packers and Bucky Badger. The next natural step was to see what the local yeasts could do. 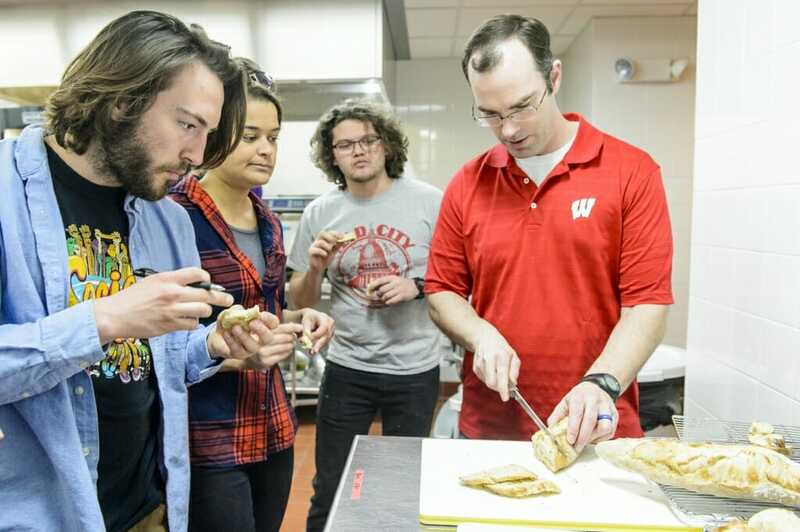 For four years now, the Wisconsin Brewing Company in Verona has brought UW–Madison food science undergraduate students into the brewery to give them hands-on experience. In an independent study class, students work with brewmaster Kirby Nelson to select a style and then develop and test a recipe. They brew the final product at commercial scale and make it widely available, including at the Wisconsin Union. The team just celebrated this year’s release of Refresh Radler, a blend of grapefruit soda and beer. Students apply lessons from the classroom to commercial brewing, says Carl Nolen, the president and CEO of Wisconsin Brewing Company, who wants to encourage students to pursue a career in fermentation science. For the third year, his brewery is offering a summer internship targeted at UW–Madison students. “It’s been a nice partnership. So far we’re all really happy with it,” says Nolen. So when the Wisconsin Alumni Research Foundation, which holds the commercial rights to the Sheboygan strain of S. eubayanus, contacted the brewery with the opportunity to create a unique style of beer, they leapt at the chance to delve into a bit of brewing history. Taming wild yeast is a challenge, says Nolen, but worth the work. 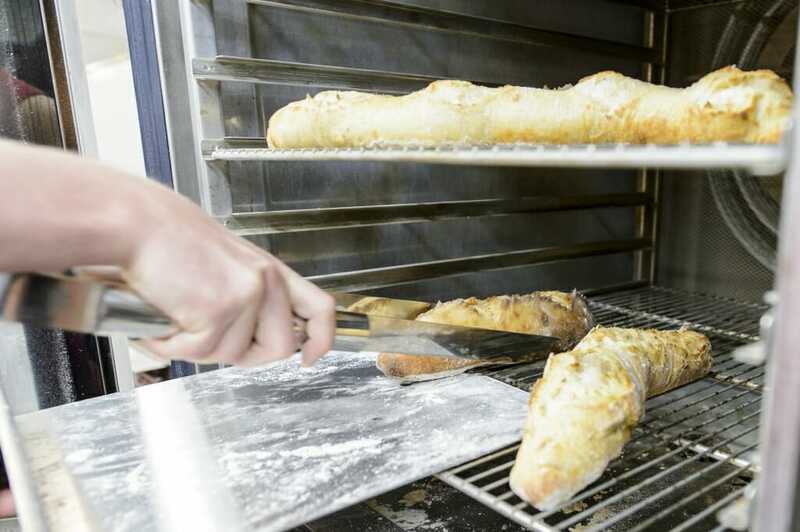 Clasen’s European Bakery has been baking bread in Middleton, Wisconsin, for almost 60 years. Tradition is the core of their business. But they are exploring new approaches by collaborating with Hittinger and the food science department. Owner Michelle Clasen is the daughter of one of the founders, Ralph Clasen, and a German-trained baker. She is donating the bakery’s sourdough cultures to Hittinger for him to investigate. These curated collections of wild yeast and other microbes are a vital, artistic, and mysterious part of the baking process. “We’re excited to work with them to answer some pretty basic questions about what is in their sourdough cultures and compare that to our database of known species,” says Hittinger. 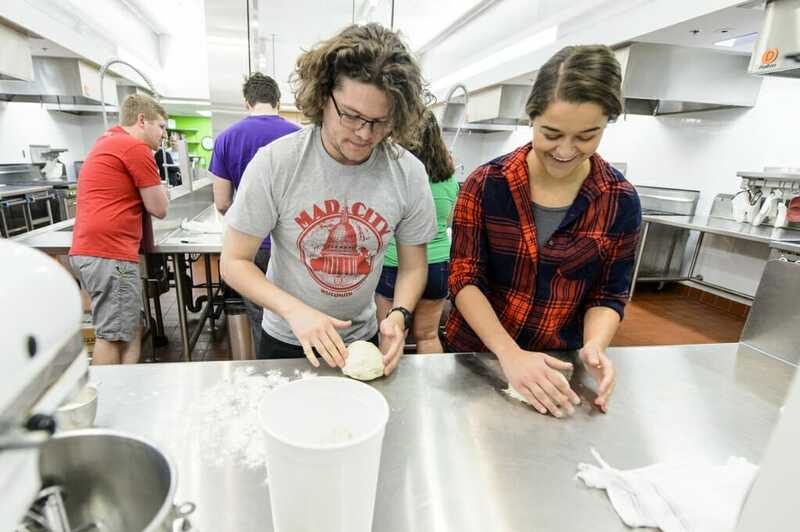 Undergraduate student Caroline Miller is leading the sourdough project in his lab. At the same time, Hittinger is giving Clasen wild strains of yeast found in Wisconsin, including S. eubayanus. Together, they are trying to see if the Wisconsin yeasts can make a good loaf of bread, ideally one with a distinct flavor. Students in the Fermented Food and Beverages class, led by instructor Nick Smith, got to inspect those wild yeasts at an April class. 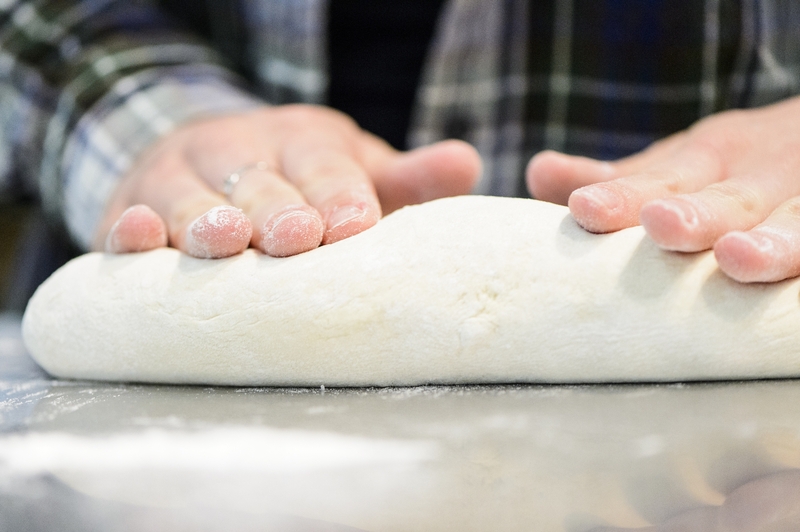 One of the required courses for the new fermentation sciences certificate, the class covers the science behind baking, brewing and winemaking. Clasen attended the class, during which students took notes on the appearance and aromas of wild yeasts rising in starter bread cultures. 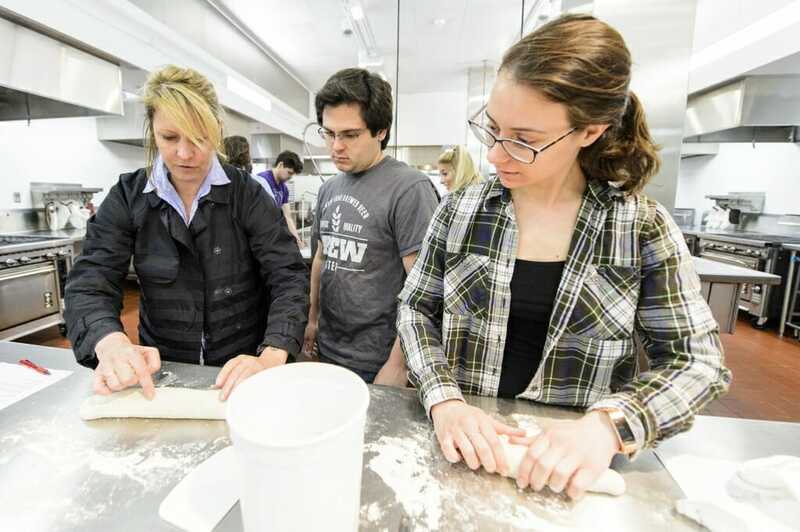 Clasen then took the students into the neighboring lab space where she demonstrated how to shape baguettes, one of her bakery’s most popular styles. Miles Gillette, a senior food science major, interned at the Wisconsin Brewing Company last summer and took the independent study class that developed the radler. He’s planning to start a career in fermentation after graduation. Chemical Engineering major Kayla Edwards co-oped at a chocolate facility and wants to use her background to work at a brewery or winery — not the typical path for a chemical engineer. 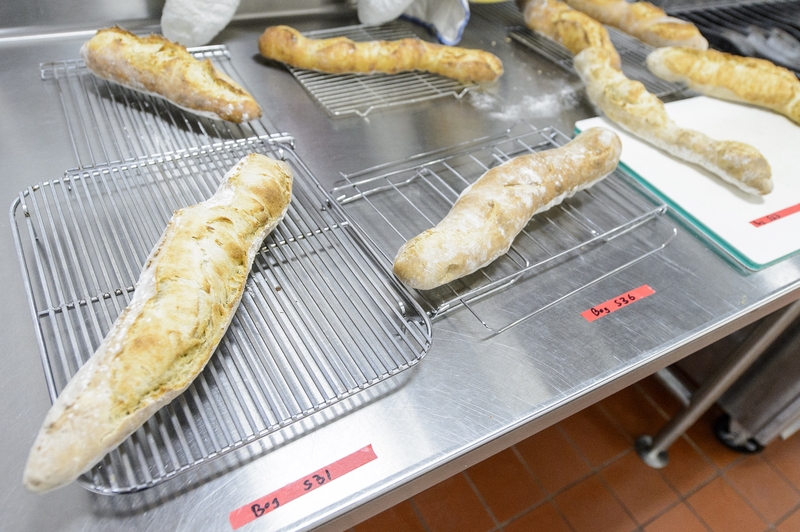 While the baguette dough rested, Clasen demonstrated several of the 45 varieties of breads from the bakery. She discussed how choices about the yeast, flour, additives and preparation of the dough create variety in the texture, flavor and shape of the finished breads. 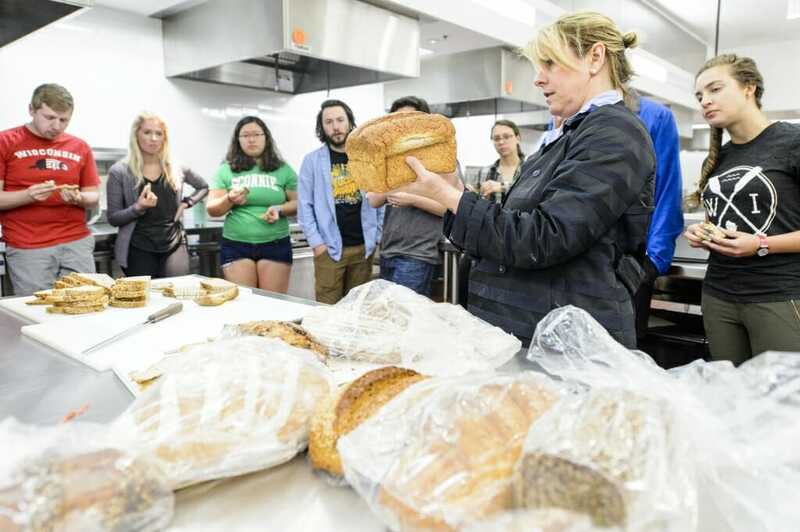 Students grabbed bites of cranberry walnut and dark rye bread as Clasen shared how her father and uncle tried to mimic San Francisco’s famous sourdough with vinegar. But as the bakery’s founders discovered, there is no substitute for the characteristic tang imparted by cultured yeast. Whether it floats through an open window or is picked up on a tree in Sheboygan, wild yeast can impart local flavor to all kinds of fermented foods. For all of his work with yeast, Hittinger admits his skill with fermentation, be it baking or brewing, is limited.